We flew back to DFW on January 1st. 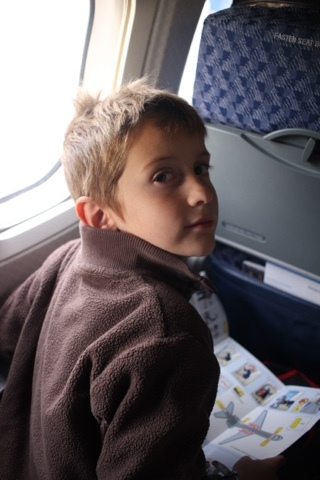 The flight was uneventful except Jack got sick on the plane. He'd been coughing so much and I kept giving him stuff to help him stop coughing, it all just came up. He was great though and very calm through it all. He finished the rest of his flight with Kyle's flannel shirt and an airplane blanket as his pants. We stayed in the Fort Worth area that night and then stopped at the Water Gardens in downtown Fort Worth to explore and take pictures. I think this is our third visit at least. It is definitely a very cool spot and great for photos. Lillian sat on a row with strangers so Kyle and I could both sit with one of the boys. The roots are so amazing! Another family shot in front of the second fountain. The kids staggered on the mountain. It makes forsome good shots though. We were in Ohio for Christmas this year, December 20- January 1st. 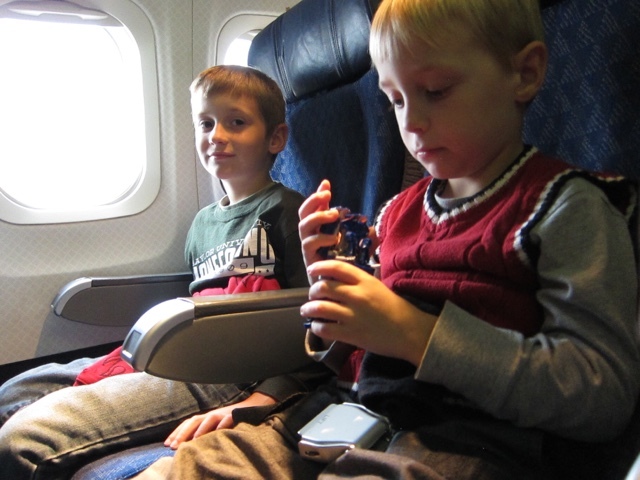 It was the boys first time to fly and really Lillian's too (the others she was pretty young). Our visit was pretty similar to our time over the summer partially due to the mild weather allowing us to visit our favorite outdoor spots. The best part however that was different was the whole Welty clan being together. We spent our days walking over to Rising Park and climbing Mt Pleasant, driving down to Hocking Hills for hikes, visiting with Great grandparents across the street, catching up with the extended family over Chrsitmas Eve and Christmas Day, and a couple nights in Columbus visiting with Kyle's high school friends and staying with Uncle Kevin. Most of these things we did multiple times. There was, very unfortunately, a great sickness that got in the way of some of our adventures and most of the Maryland Weltys were sick at some point including Naomi who ended up in the hospital for 3-4 days(! ).